Microsoft launches Xbox Music and Xbox SmartGlass second screen app | What Hi-Fi? Microsoft has confirmed its new Xbox Music service and revealed details of its new Xbox SmartGlass app, which is set to launch on October 26th. The new SmartGlass app allows you to wirelessly stream and share music and video across multiple devices, from your phone to TV to computer, effectively adding a second screen to the Xbox experience. Launching on Windows 8 devices, a SmartGlass app for Android and iPhone/iPad will also follow in 2013. 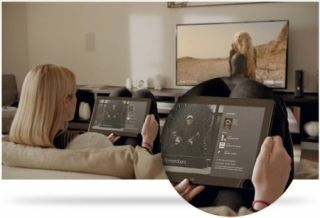 The app allows you to pause a movie on a Windows 8 device and then seamlessly pick up from where you paused on another device, such as your Xbox 360 connected to your TV. Switch the content to your TV, for example, and the SmartGlass app then turns your second screen in to an information source for the film, TV show or music track that you're watching. Information on related artists, biographies of actors, and further suggested content will then be on hand via your mobile or tablet, with the content updating automatically from track to track or scene to scene. Xbox Music meanwhile is Microsoft's music service that aims to take on online digital behemoths iTunes and Spotify. Coming in free and premium versions (unlimited streaming for £8.99 a month), the service packs a Smart DJ function to help trawl through music libraries for similar artists and the promise of syncing your account to other devices. SmartGlass functionality mirrors that of video content, giving users the capacity to control music playback across linked devices. October 26th. The Xbox Music update is rolling out to Xbox 360s from today (it will come pre-installed on Windows 8 devices).